We’re in Wallonia, Belgium’s French-speaking region. 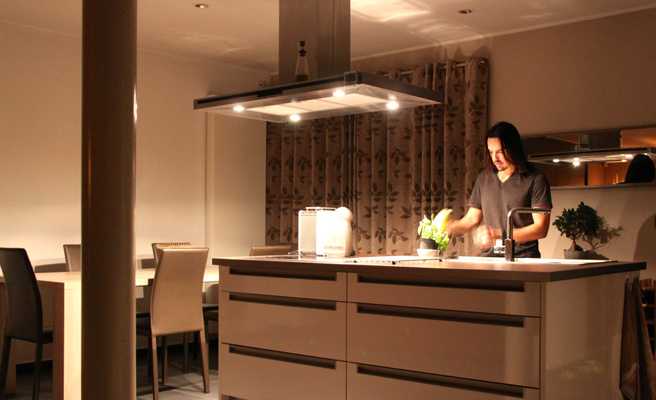 Julien and his wife have been living in a fully renovated old country house for five years. The old boiler was running on its last legs to heat up the vast open space area. It needed some relief with an energy-saving alternative that still looked good in a living area with a minimal look. Why did you choose pellets instead of the wood? 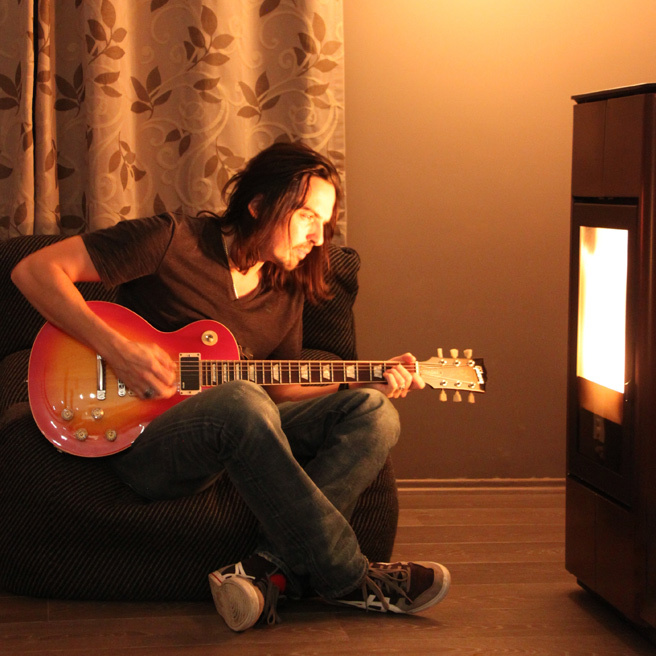 At first, I turned to wood because of the unique charm of the flames and I wanted to create a nice atmosphere in the sitting room. However, storing wood was a real issue, as I didn’t have a lot of space in the garden. At the same time, I had already gathered information on the technology used for pellet stoves. There were pros and, of course, cons. The main advantage is that you can programme it and the second one is the fact that storing pellets is much neater and easier compared to wood. 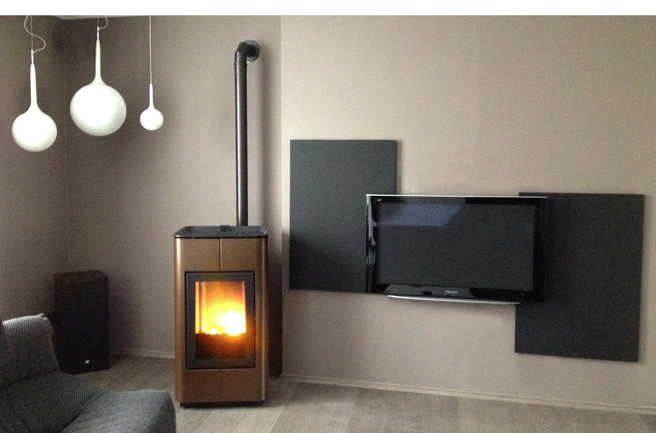 The main drawback to pellet stoves, though, is the flame, which is very different from the real flame of a wood-burning stove and the other issue is the noise when the ventilation is on. Which model did you turn to in the end? Just by chance, when I was searching, I came across MCZ’s website, which at the time was presenting the new 2013 models, including Tray. Its essential design and its magnificent bronze colour fitted in perfectly with my interiors. 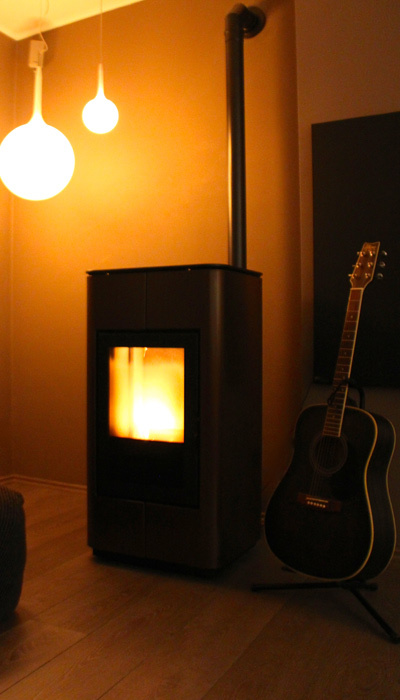 It has “Still” technology, which means it is silent and then there is the flame: finally, a pellet stove that is as good as a wood stove! How come you needed a stove without ventilation? I mentioned earlier the drawback with the noise of the ventilation system which many people discover when using pellet stoves. But here, with Tray, that is no longer an issue: I have a superb flame and without ventilation! The stove is installed at the centre of the sitting room, less than 2 metres away from the armchairs. It is very important that nothing disrupts the music you are listening to, the film you are watching or simply the cat who is taking a nap! The stove is placed in a position that is more favourable for the living room, as if it were an additional guest invited to drinks before dinner in the sitting room. This advantageous position means that it is unmistakably noticed by visitors and this creates a great atmosphere, as well as adding lots of warmth (both literally and figuratively!). Now, my dear oil-fired boiler is kind of sulking, but at least it is on a well-deserved holidays and my wallet is happy too! Tell us about your first impressions by using this stove. I’ve been using it for a few weeks and I already know how to use the remote control perfectly, something that initially might look a bit complicated. After all, the programs are easy to set. Actually, using it is as easy as using an electronic thermostat on an oil-fired or gas central heating system. It’s very nice to wake up in the morning and not have to put a log in the stove to get warm. I bought the optional ventilation also, but I haven't used it yet. I know that the house will be quicker to warm up when it will be really cold outside. Its silent operation on an everyday basis is something I really appreciate, you just hear the pellets falling irregularly in the crucible. When the outdoor temperature is between 8 and 12°C, I use just over 3 bags with 15 kg of pellets a week and it has an operating time of about 3 days, something I appreciate a lot. Maintenance is very quick. Less than 20 minutes every 3 days to clean the glass and hoover up any mess. The frequency of maintenance work depends greatly on the quality of the pellets you burn. So I’m very happy with this heating method and especially in having chosen this model from MCZ: it combines design, ease of use and now watching pellets burn is as beautiful as watching a log burn! I wouldn’t be able to do without it! Trends, news, tips, stories and settings related to fire via Facebook, Pinterest or Instagram. Just one click! Ready for your pellet supply? Let's go to the expert to find out which pellet is the best to buy.